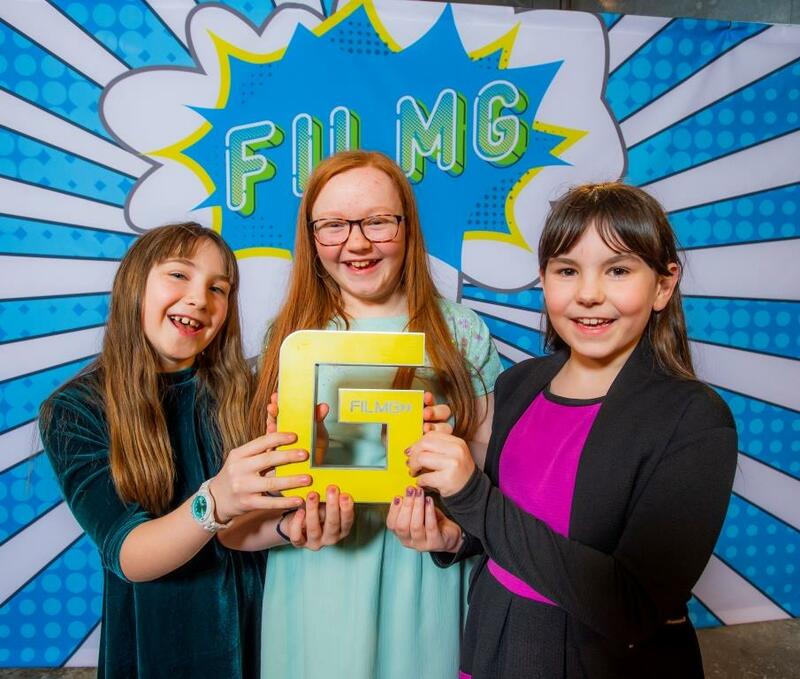 Three schools in the Highlands have brought a number of prestigious awards home from the 11th FilmG Awards held at the weekend (on 8 February) in Glasgow’s Old Fruitmarket. FilmG is a brilliant platform for filmmakers and creative people to try new ideas, or to showcase their talents, and a further opportunity to use their Gaelic. Bun-Sgoil Stafainn won, The Peoples’ Choice Award & Best Youth Group Film. Millburn Academy S4 pupils won the FilmG Award for Gaelic – Learners; and Elissa Hunter-Dorans from Milburn Academy, won the Best Mobile Short in the Youth category. Lochaber High won Best Film in the Youth category. Another big winner of the night was Glaiste, which won two of the three awards it was nominated for. Eilidh Johnson from Dingwall is the force behind the award-winning Glaiste, which is a haunting stop-motion film about mental health. The thought-provoking piece won Best Mobile Short and HIE Most Promising Director, seeing Eilidh win two incredible placements within the media industry including at BBC’s The Social. In attendance on the evening was Deputy First Minister John Swinney MSP, who said: “My congratulations to Lochaber High School, and all the winners and nominees of tonight’s awards. Tha trì sgoiltean sa Ghàidhealtachd air grunn dhuaisean cliùiteach a thoirt dhachaigh bho na 11mh Duaisean FilmG a chaidh a chumail aig an deireadh-sheachdain (air 8 Gearran) ann an Seann Mhargaidh Mheasan Ghlaschu. ’S e àrd-ùrlar air leth a th’ ann am FilmG gus cothrom a thoirt do luchd-film is do dhaoine cruthachail gus beachd-smuaintean ùra fheuchainn, an cuid tàlantan a thaisbeanadh, agus cothrom eile fhaighinn an cuid Gàidhlig a chleachdadh. Choisinn Bun-Sgoil Stafainn Duais Roghainn an t-Sluaigh & Duais Film Buidheann Òigridh as Fheàrr. Choisinn sgoilearan S4 à Acadamaidh Allt a’ Mhuilinn Duais Ghàidhlig Film G do Luchd-ionnsachaidh; agus choisinn Elissa Hunter-Dorans bho Acadamaidh Allt a’ Mhuilinn am Film Fòn-làimhe as Fheàrr ann an Roinn na h-Òigridh. Choisinn Àrd-Sgoil Loch Abar am Film as Fheàrr ann an Roinn na h-Òigridh. Bha Glaiste am measg nam filmichean a bu shoirbheachaile, agus bhuannaich e dà dhuais anns na trì geàrr-liostaichean air an robh e a’ nochdadh. ’S i Eilidh NicIain às Inbhir Pheofharain a tha air cùl Glaiste, film tiamhaidh a thaobh slàinte-inntinn. Choisinn am film smuainteachail na duaisean Film Fòn-làimhe as Fheàrr agus Stiùiriche as Gealltanaiche le HIE, agus tha Eilidh a-nis air dà ghreis-obrach shònraichte anns na meadhanan a chosnadh dhi fhèin, agus aon dhiubh sin le BBC The Social. Tha Riaghaltas na h-Alba air a’ phrìomh dhuais ann an Roinn na h-Òigridh, Film as Fheàrr, a mhaoineachadh agus ’s e Àrd-Sgoil Loch Abar sa Ghearasdan a ghlèidh i am-bliadhna. Tha am film seo, Origàmi, coltach ri grunn fhilmichean eile am-bliadhna, stèidhichte air burraidheachd, ach eu-coltach ri càch, ’s ann bho shealladh a’ bhurraidh a tha am film seo. Bha Leas-phrìomh-mhinistear na h-Alba, John Swinney BPA, an làthair air an oidhche agus thuirt e: “Bu thoil leam meal a naidheachd a chur air Àrd-Sgoil Loch Abar, agus air a h-uile duine a shoirbhich a-nochd agus a choisinn àite air geàrr-liosta nan duaisean. “Tha sinn fhèin ag aithneachadh gu bheil buannachdan cultarail, eaconamach, foghlaim is sòisealta do dh’Alba gu lèir anns a’ Ghàidhlig agus anns a’ chultar. ’S e sin as adhbhar gu bheil sinn ag iarraidh àireamh luchd-cleachdaidh a’ chànain a thoirt am meud agus na cothroman làitheil airson an cànan a chleachdadh a leudachadh. Tha FilmG ga lìbhrigeadh le MG ALBA agus a’ chompanaidh mheadhanan Sgitheanach, Cànan Graphics Studio, agus tha e fa-near tàlant anns na meadhanan Gàidhlig a neartachadh. ’S e seo aonamh bliadhna deug na co-fharpais, agus tha FilmG air a’ chiad chothrom a thoirt do iomadh neach a tha a-nis ag obair ann an gnìomhachas film is telebhisein na Gàidhlig.